The federal government this week contributed $250,000 to a group that works in preventing senior citizens from falling, an issue that increases in significance as the population ages. Guylaine Malette-Robichaud is a public health nurse with the Porcupine Health Unit, and its lead for the Stay on Your Feet Strategy. 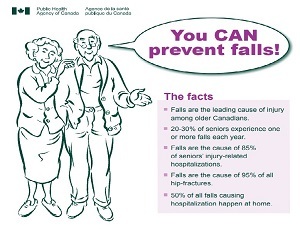 Malette-Robichaud adds that one third of people over the age of 65 will fall at least once a year. That climbs to one half once they reach the age of 80. Malette-Robichaud says physical fitness maintains the ability to balance. She adds that the health unit tries to ensure that free exercise classes are available to seniors in all the communities it serves. Reduce potential tripping hazards in the home, i.e. area rugs, electrical cords.